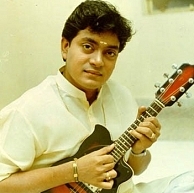 A world renowned Carnatic musician and a legendary Mandolin player, U. Srinivas passed away today morning after a brief period of illness. He was admitted at the Apollo Hospitals in Chennai and breathed his last at around 9 30 am in the morning. He is reported to have had a liver problem. This news has come as a shocker to all and the sadder fact is he was just 45. Behindwoods prays for the departed soul to rest in peace. It's an irreplaceable loss indeed, to the world of music. "Naa Thyaagi nu laam solla maatten, aana kandippa Dhrohi illa"
People looking for online information on Mandolin Shrinivas, Mandolin Shrinivas death, Mandolin Shrinivas passes away, Mandolin Srinivas, Mandolin Srinivas death, Mandolin Srinivas passes away will find this news story useful.